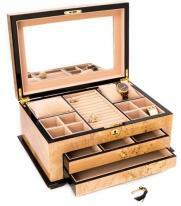 Standing Jewelry Box | Buy Standing Jewelry Box Armoires Online! Store your necklaces tangle free in our elegant standing jewelry cases. A dresser top mini or floor model makes it easy to organize jewelry. Choose a standing jewelry box with swing out cabinet sides or a hidden necklace drop in a dresser top or floor standing design. Floor standing wooden jewelry armoires feature divided storage sections to organize earrings, bracelets and brooches, mirrored lids, ring rolls and swing out necklace sides for storing necklaces in order. Designed to hold a large jewelry collection, these standing jewelry boxes are also perfect for keeping lingerie, scarves and other accessories organized and within easy reach. If you don't see the jewelry armoire you are looking for, we welcome your call or email. All jewelry armoires qualify for Free US Shipping, easy 30 day returns and 1 year product warranties.